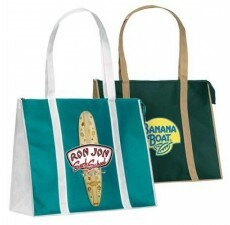 The T-shirt style of these Reusable T-Shirt Bags provides a unique spin on the reusable grocery bags concept and is a great earth-friendly alternative to plastic bags. 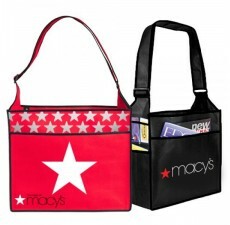 This tote is constructed with "Maxi-Weld" binding, a novel machine-made sealing process, which creates strong seams and offers significant savings over the traditionally sewn hems you may see on other promotional tote bags. 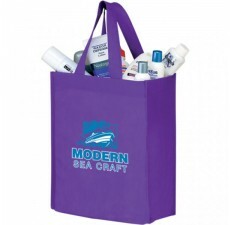 This tote's affordable, alternative manufacturing process helps to ensure its strength. 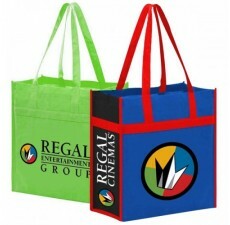 Also, this bag is 100% recyclable and planet-friendly, as it contains 20% post-industrial content in support of the recycling industry. 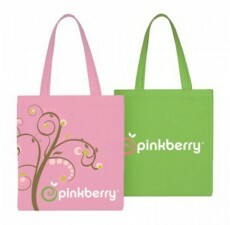 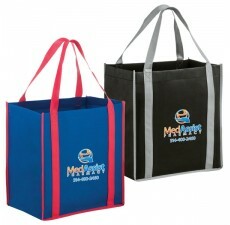 Order this bag in a variety of colors, and get your logo imprinted directly on the bag. 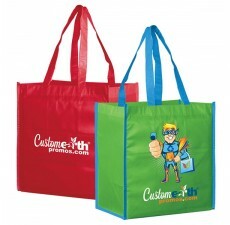 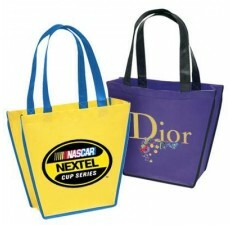 Contact Custom Grocery Bags with any customization or design questions that you may have.